Yogiji Maharaj was the fourth spiritual successor. He was initiated into the sadhu-fold at the age of 16 and named Sadhu Jnanjivandas. But so transparent was the mystical joy within him, that he was fondly called Yogiji. Devotion, service, tolerance, penance, humility and countless such virtues flowered within his fragile frame. Living singularly on the word of his Guru Shastriji Maharaj, Yogiji Maharaj won the love of one and all. He witnessed abundant divinity in everything and everyone - he even blessed those who censured him and praised those who persecuted him. 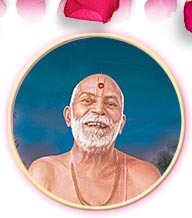 With a vision set far into the future, Yogiji Maharaj established children and youth centers. He inspired Satsang activities in every town and village he visited, repeatedly writing words of guidance and encouragement to each newly formed group. The mandirs and centers he created resounded with the energy of the young. His lectures were addressed to bright, young college students, for he believed in these youngsters. He encouraged music, art and literature. Scores of youths regularly traveled with him, savoring his selfless love and knowledge. It was he who lifted the Sanstha to international proportions by touring through East Africa and England to establish new centers. His efforts have mushroomed into the worldwide socio-religious organization we see today. Life Span: 79 years (1892 - 1971 CE). As Guru: 20 years (1951 - 1971 CE).